TLV recently participated in the 39th Energy and Environment Exhibition (ENEX) in Tokyo, Japan, organized by the Energy Conservation Center of Japan (ECCJ). Tokyo’s expansive Big Sight exhibition hall served as the venue, welcoming over 47,000 attendees to the three-day event. Companies from all over the country filled the halls with presentations on new technologies in energy generation and conservation, protecting the environment, and a myriad of related topics. TLV would especially like to thank all those who took the time to stop by the TLV booth and inquire about TLV products and services. In particular, the SonicMan® diagnostic tool garnered much attention. TLV representatives demonstrated the tool’s ability to detect pipe leaks on a live demonstration, and visitors also had the chance to use the SonicMan® for themselves. Other products featured at the TLV booth included TrapMan®, Paralign (TTS), and a display of popular products from TLV’s steam trap lineup. 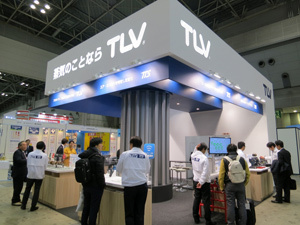 Over the course of three days, TLV enjoyed getting to share products and knowledge with a wide variety of interested patrons from all across Japan and the world. For more information on ENEX and to see next year's itinerary, please check the official ENEX site.